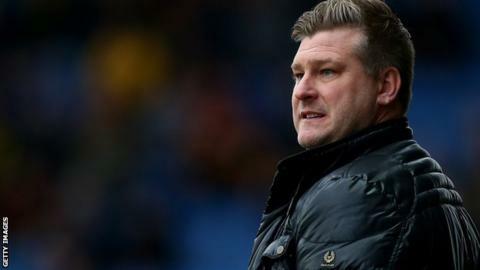 Oxford United head coach Karl Robinson says he will take the club's on and off-field problems on his own shoulders amid a relegation fight. His side lost 4-2 at Accrington on Tuesday and dropped to third from bottom in League One. Defeat came a day after the club was served with a winding-up petition from the owners of the Kassam Stadium. "Some clubs make mountains out of molehills, but that's not the case here," Robinson told BBC Radio Oxford. "I've a lot to deal with here and a lot that falls on my shoulders that I'm prepared to bear." United are winless in their past five league games and sit a point adrift of safety before they visit Blackpool on Saturday. "In both boxes, we were found wanting," Robinson said after defeat by Accrington. "We've got to be ruthless. I can't ask any more of the players, we're just not clinical when the chances come along. "We have to be honest with ourselves that results haven't been good enough. The performances have, but we find ourselves in a relegation fight and a real serious one." Robinson also revealed the club have given him reassurances a fourth winding-up petition in the last year will be resolved before a scheduled High Court hearing on 27 February. Firoka, owned by former U's chairman Firoz Kassam, claim the League One side owes them £240,000. The club has told BBC Radio Oxford funding "has been agreed in principle for the due amount to be paid".